During the 16th century, Japan was initiated in direct commercial and cultural exchange with Portugal and the West. Starting in 1603 until the Meiji Restoration in 1868, Japan was under a strict isolationist sakoku policy which rung the Edo period. Studies on Western culture, known as rangaku (蘭学), or "Dutch learning", continued through Dutch contact and kokugaku (国学), or "national studies" were commonplace in regards to Japan's isolation. In 1854, Japan was bombarded by the United States to engage in trade. Riots were common in the streets and Westernization in 1868 led to the resignation to the shogun and the rise of Emperor Meiji Mutsuhito, named Meiji in Japan. After Japan defeated both China and Russia, trade with the United States was cut off. During Taisho Yoshihito's reign, militarization led to the occupation of Taiwan, which would become the Republic of China in 1949, Karafuto (樺太), or Sakhalin, and Kankoku, or Korea. Japan expanded during Showa Hirohito's rule, occupying Manchuria, a puppet state, Indochina, and several Indonesian countries. WWII began and ended with encounters with Japan. Japan had an exclusive monetary system in the Edo era. 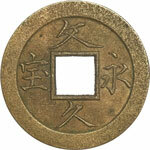 Starting during the end of the 7th century, Japan issued cast bronze coins called Mon, similar to China's cash coinage. Several decades later Japan issued silver and gold coins, where Taiheigenbō (大平元寶), a silver coin, was worth 10 mon, and Kaikishōhō (開基勝寶), a gold coin, was worth ten Taiheigenbō, all of which were somewhat identical to their Mon counterparts. After the remintage of local currencies, Japan reformed the old Mon currency and, in 1871, Japan issued the Yen (圓), which means "round object" and is pronounced en. The yen was organized in a new system, based on 1000: 1 Yen (圓) = 100 Sen (銭) = 1000 Rin (厘) and 1 Yen was worth 0.78 troy ounces of silver. The Yen during Meiji and Taisho's reigns were worth about US$0.5. However, during the end of Taisho's rule and beginning of Showa's rule, the Yen was slowly declining in value. Rin ended issue in the early 20's and was demonetized in the 30's and 40's, where it was worth much little. Japan, during the WWII era, issued coins made of cheap metals, such as tin, aluminium, and nickel instead of silver. After WWII, Japan was very poor and the Yen was fixed at ¥360 to the USD, and was written 円. The sen, now worthless, was demonetized in the late 40's. Ever since the fall of the yen, it has become one of the strongest currencies in the world. 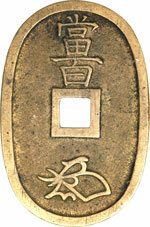 Almost all of Japanese coinage uses Chinese characters, known as Kanji. Exceptions include early forms of Katakana as mintmarks on old Ryō coinage. Many characters after 1946 are written in Shinjitai, simplified Kanji, and before 1946 all characters are written in Kyūjitai, or traditional Kanji. The Kanji characters correspond with the writing on the coins. 本日大* Dai Nippon "Big Japan"
Although "sen" in Japanese is 1000, the word sen has two character meanings: 千, 銭. The financial form was often used in postage rather than coinage. Ryō coinage usually show only two pieces of information: On one side the era name (two Kanji characters, vertically printed) and the "money" mark in Kanji (寶通, tsūhō). On the other side, the mint mark is in Kanji, usually poorly stamped, or blank. To translate coin dates starting from the Meiji era, use the calendar converter, or see the examples below. Many pre-Meiji coins do not have an era date; some do not have any characters at all. It is best to simply choose the coin that is identical to the list provided. The era markings are usually one character only. Gold pre-Meiji coins often have different purities. Please be aware of this, and identify the piece with someone who specializes in identifying gold purities. The era name is shown on both sides, 宝, short for the Hōei era. These silver coins are known as "bean money" because they are shaped like beans. The obverse and reverse both have the "God of Plenty" design. 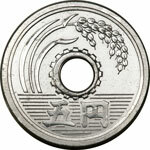 The era name is on the obverse, 天保 representing the Tenpō era. 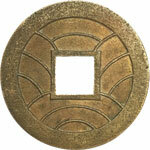 The reverse reads 當百, meaning "Mon 100"
This 50mm coin is found here. 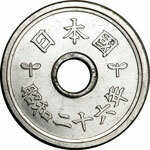 The era name is on the obverse, 文久 representing the Bunkyū era. This coin was specifically machine struck. Note how the year is read from right to left. 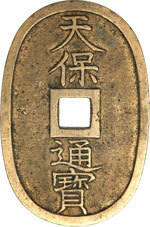 This is the first official Meiji-era Japanese coin, 5 Sen, Y#1. This is one of many Japanese Empire pattern coins, 20 Sen, KM#Pn46. 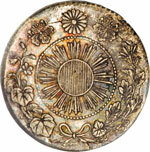 This is an early Aluminium pattern for the modern 5 Yen, Y#72. This pattern is written in Kyūjitai (國) and Shinjitai (円) which was modified in 1959. This is a widely circulated coin in Japan. Y#125. The Imperial Seal is a mon used by the Japanese Imperial family. 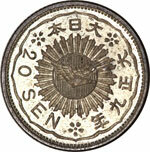 It has been used on coinage since the first Meiji coin. 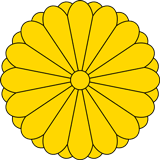 The symbol represents a 16 petal chrysanthemum with 16 tips behind the first row. The symbol is yellow with black or red outlines. 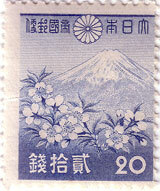 This postage stamp uses the financial characters 銭拾貳 and has the imperial seal. 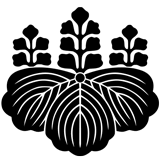 Also known as the Paulowina Seal, or Kirimon, it is a mon used by the Cabinet and Government of Japan. 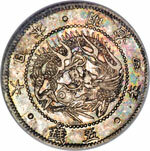 It has been used on pre-Meiji coins as well as modern coins. The symbol represents three paulowina leaves with flowers on each leaf. 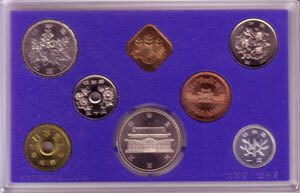 Coin sets from Japan usually compose of the circulating coins in Uncirculated and Prooflike condition. They may contain a commemorative coin not found in circulation and a square token with the year inscribed on it. The cases are provided by the Mint Bureau of Japan and are made of easy-to-open plastic cases. All cases are sold in small paper boxes with a description in Japanese and English, along with the compositions in Japanese and English.